The first show of the summer leg of the band's Not In This Lifetime tour. The show featured a rare appearence of Raw Power. Just a couple more days now and it is on again! Guns N' Roses has been "rehearsing every song they know" ahead of Thursday's tour kickoff in Detroit, the band's production manager said this afternoon. The group is expected to perform for more than 2½ hours once it hits the Ford Field stage, said Dale (Opie) Skjerseth, who's overseeing the nuts and bolts of GNR's Not in This Lifetime Tour. The outing reunites Axl Rose, Slash and Duff McKagan for their first nationwide run together in more than two decades. "It'll be their first night," Skjerseth said. "They'll be fresh and want to try everything." The Not in This Lifetime Tour is a reliably big GNR effort involving 125 crew members, 36 trucks and 15 tour buses. The Ford Field setup started last week — as soon as Beyoncé's show was packed up and gone — and band members have been rolling in since the weekend. Axl, Slash and company rehearsed for 3½ hours at Ford Field on Tuesday night, and will be back for another round of fine-tuning this evening. OK, so now we have to ask: Why did that have to take so long, exactly?! For the first time in 23 years, a Guns N’ Roses fronted by Axl Rose, Slash and Duff McKagan occupied a Detroit stage, as the reunited band played an electric, vigorous show Thursday night at Ford Field. It was the kind of night that had rock magic pumping through the veins of the packed stadium — a high-energy 2½-hour affair that kicked off the group’s Not in This Lifetime Tour after a handful of April dates. Before the doors even opened, this was the Motor City’s biggest rock event so far this year. GNR made good on the moment, conjuring the loose, tattooed, swaggering power of the band’s golden years without loitering in nostalgia and with just enough tattered edges to keep it all real. Thursday was a chance to reassert a brand of rock 'n' roll whose alpha spot in music culture has given way to newer sounds and trends. And the trio at the heart of the action — now all in their 50s — proved up to the task. Showing up promptly as scheduled, just before 9:45 p.m., GNR hit the ground running with a potent “Appetite for Destruction” twofer, serving up “It’s So Easy” and “Mr. Brownstone” as Ford Field filled with the glow of cell phone cameras. Slash and McKagan — absent all those years as Rose carried the Guns N’ Roses franchise —seemed game for “Chinese Democracy,” one of three selections from the Rose-crafted album of the same. But this was by and large an evening for romping in the band’s vintage repertoire, and by the time the set arrived at “Rocket Queen” and “You Could Be Mine,” the years had melted away. Rose, nimble again after the broken foot that kept him chair-bound in the spring, was a visual focal point, scampering across the stage and working the staircase alongside the drum riser. And the newly minted AC/DC singer was in consistently solid voice, the bold scream that opened an early “Welcome to the Jungle” holding up strong as the night went on. “Out Ta Get Me” and “Nightrain” were high-flying highlights in a set that gave Slash plenty of room for guitar heroics, including the left-field treat “Coma” and an instrumental cover of Pink Floyd’s “Wish You Were” that paired him with second guitarist Richard Fortus. The show's most emotive moments came, as expected, from the assortment of "Use Your Illusion" material, including a sloppily started "November Rain" with Rose at piano and a sweeping "Don't Cry" to open the encore. Fortus, making periodic forays up front to join GNR’s big three, was part of a solid supporting cast that included drummer Frank Ferrer along with keyboardists Dizzy Reed and newcomer Melissa Reese. A confetti-strewn, flame-filled "Paradise City" wrapped it all up with a bang, one last round of seasoned energy and attitude. Guns N' Roses may be older now, a little chunkier in the middle. The onstage camaraderie may or may not be forced, on a reunion tour that's dangling multimillion-dollar paydays. But for most of Thursday night, it was as if Axl, Slash and Duff had stepped right off a tour bus from 1993. Detroit Rock City became Paradise City Thursday night as a reunited Guns N’ Roses tore through a 24-song, two-and-a-half hour barn burner of a set to kick off its “Not in This Lifetime” tour in front of a hot crowd of 41,000 rock and roll fans at Ford Field. This was a fun one. Squint and it was the Guns N’ Roses of yore: Axl Rose darting across the stage, shuffling in place, and looking like a demon serpent as he howled into his microphone; Slash, virtually unchanged in appearance from the “Appetite for Destruction” days, ripping solos in a sleeveless black T-shirt, black leather pants, a black top hat and mirrored sunglasses; and Duff McKagen, bass slung low, somehow looking 10 pounds leaner than he did in 1987 and still every bit as cool. But this was not the Guns N’ Roses of yesteryear, who flamed out in spectacular, inevitable fashion while touring behind the “Use Your Illusion” albums in 1993. That group was chaotic, ready to spin out of control at any second. Thursday’s GNR was ready to play nice and prove they’re not a ticking timebomb, even hitting the stage at the very un-GNR like time of 9:43 p.m. Punctuality is one thing, but they were actually early, taking the stage two minutes prior to their advertised start time. Truthfully, it was probably a little too early for Axl, who took several songs to hit his groove on Thursday. He appeared winded during opener “It’s So Easy,” and had yet to fully prime his vocals; it looked like he might not make it through the night, let alone the tour. Turns out he was just easing into the evening: He was better during “Mr. Brownstone,” and when he shrieked “Do you know where you are?” during “Welcome to the Jungle,” he was back in Axl mode. “Estranged,” one of the pompous epics off of “Use Your Illusion,” was where the full band started to click, and “You Could Be Mine,” set against a backdrop of pyrotechnics and flames, roared with a seething, snarling, bitter energy. “Coma,” with Slash rattling off riffs like shotgun blasts, was like a dirty bomb, bringing a sense of danger back to this new version of GNR, making it more than an approximation of what once was, or a theme park ride. Meanwhile, “Out ta Get Me” ended with Axl practically beating his chest, bellowing “take that one to your Detroit heart!” at the close of the song. It was a triumphant moment. Axl was playing nice at the beginning of the show but there were glimpses of his old cantankerous self, first when he chastised the food options in the city (“everything here is (expletive) fried,” he said, saying he should invest in vegetable oil in Detroit) and later wondering aloud if the crowd was going to sing “Knockin’ on Heaven’s Door” with him (“are you gonna help me out, or is it, ‘No, (expletive) you, Axl?’”). But there were some warm moments as well; during “Sweet Child O’ Mine,” the video screens caught Axl looking over at Slash and smiling as the guitarist cut through a solo, and he looked at him not as a bandmate or a co-worker but like a fan, in awe of his Godlike guitar skills. There also seemed to be a hint of regret over all those years they spent locked in a bitter feud with one another. Those days are over, at least as long as there are contracts and paychecks ahead of them, but that’s a cynical way to look at the tour. The truth is it’s an evening of good old fashioned hard rock at a time when there’s not a lot of good old fashioned hard rock filling stadiums. “Do you know where you are?” Fair question, But on Thursday, everything seemed right where it should be. DETROIT -- “Do you know where you are? !” Axl Rose bellowed, as he customarily does, at the beginning of “Welcome To the Jungle” on Thursday night, June 23, at Ford Field. The answer was evident to the 41,000 who packed the stadium -- at a Guns N’ Roses show, the way it’s supposed to be. 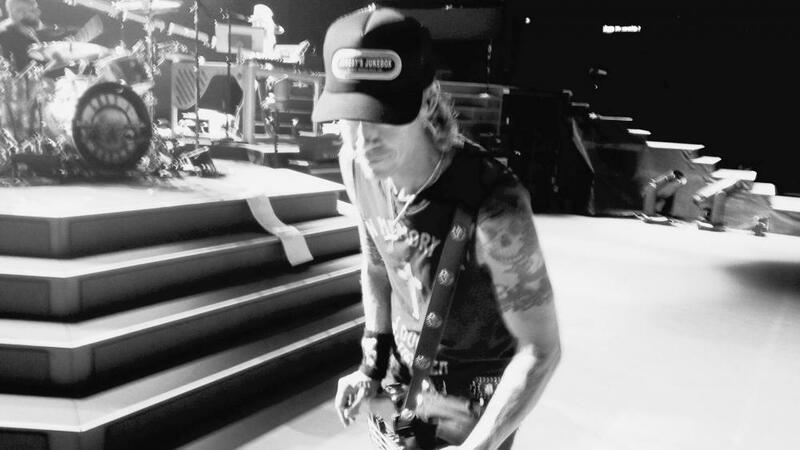 The kickoff show of the venerable hard rock group’s Not In This Lifetime Tour found Rose again playing with GNR co-founders Slash and Duff McKagan for the first time in more than two decades. The seven-member troupe played seven shows back in April, and Thursday’s tour opener found GNR tuned and tight, with Rose primed after a recent European run fronting AC/DC and the other band members sounding like they’d spent the past two months pent up and ready to rock again. And they exploded with a two-hour-and-35-minute show that started “early” by GNR standards, just before 9:45 p.m., and was as explosive as the pyrotechnics that accented several of the 25 songs the group played. Following a taut 40-minute, favorites-filled opening set by Alice In Chains, GNR was introduced by its logo on the video screen, with the pistols firing shots as the band members prepared to enter. Following taped intro music (the “Looney Tunes” cartoon theme and “The Equalizer”) GNR charged into a breathless blitz of “It’s So Easy,” “Mr. Brownstone,” “Chinese Democracy” and “Welcome To the Jungle,” with Slash and fellow guitarist Richard Fortus propelling the arrangements and Rose, freed from the “throne” he sat in during most of the April shows due to a broken foot, prowling the stage with his trademark shuffles and gallops. But the real testament of GNR’s 2016 potency came during back-to-back epics, the thrashy “Double Talkin’ Jive” and the pompy “Estranged,” which let the group -- and particularly a madly soloing Slash -- stretch out with the ferocious intensity that was GNR’s stock in trade when the group ruled the rock world during the late 80s and early 90s. From there GNR landed one musical punch after another. The show was perhaps long to a fault -- at least a couple of songs could have been sidelined without much harm -- but the likes of “Rocket Queen,” “Coma,” “Civil War,” “Out Ta Get Me,” “November Rain” (preceded by an instrumental jam on Pink Floyd’s “Wish You Were Here”) and “Sweet Child O’ Mine” were all memorable standouts. McKagan also gave Detroit’s rock heritage a nod by singing a cover of Iggy & the Stooges’ “Raw Power,” while both he and drummer Frank Ferrer wore Detroit T-shirts onstage. And Rose -- who sported six different T-shirts, a leather jacket, five hats and a couple of bandanas during the night -- was a visibly happy camper, energized and animated and in fine voice, right up to his long wails during GNR’s cover of Wings’ “Live and Let Die” He offered a few random comments -- “Everything is friend around here,” he said of the city’s culinary scene. “The first thing I’d do for Detroit is put a tariff on vegetable oil.” -- but mostly, and wisely, Rose let GNR’s music do the talking. One of the show’s nicest moments, meanwhile, came when the singer leaned on Slash’s shoulder during Bob Dylan’s “Knockin’ On Heaven’s Door.” It was a sign that animosities were buried and bygones were bygones, and that GNR -- which finished with an encore of “Don’t Cry,” a rendition of the Who single “The Seeker” and a fireworks-laden “Paradise City” -- is in top form as it enters a potential new lifetime. The group's Not in This Lifetime tour, which launched in Detroit last night, left the earlier Guns N' Roses classic reunion dates – a warm up gig in Los Angeles in April, then a few Las Vegas shows, with a double weekend at Coachella to top it off – feeling like nothing but mere practice. This was the real thing, the thing we'd all been waiting for: the triumphant return of one of the most important bands to cross rock music history. And it happened in our lifetime. Whatever bumpy start the reunion got off to – a criticized lineup, which featured original members Axl Rose, Slash and Duff McKagan, but not Izzy Stradlin and Steven Adler; a broken foot for Rose at the very first gig; lengthy delays – had mostly smoothed itself out by Thursday night. Not only were Guns N' Roses on time in Detroit, but they were two minutes early. With an expected start time between 9:45 p.m. to 10 p.m., Guns N' Roses promptly took the stage at 9:43 p.m., making it clear they're no longer playing games. On a bi-level setup backed by a video screen with additional screens on each side of the stage, Slash and McKagan were first to emerge, followed by Dizzy Reed and newer Guns N' Roses members Richard Fortus, Frank Ferrer and Melissa Reese. Then a completely mobile Rose burst onstage last with a boundless energy and lust for the performance that lay ahead. Rose, who initially borrowed the throne used by Foo Fighters' Dave Grohl after he broke his leg last summer, ruled without one: Detroit saw Rose in full force, letting loose the snake-like moves that defined the Guns N' Roses look. While Rose often let his weight sit on his right foot (he had broken a bone in the left one), it never once limited him from spinning, hopping and darting from the back of the stage to the front of the catwalk that stretched into the crowd. Rose continuously thrilled with his immense vocal range – especially seated at the piano for "November Rain" – which was always precise and extraordinarily fresh despite coming off of a string of dates with AC/DC, where he filled in for vocalist Brian Johnson. But he never let himself become the star of the show: Slash shined as often as Rose (if not more), letting his unrivaled guitar skills speak for themselves. Most solos were extended and spotlighted, but none spoke louder than his cover of The Godfather theme – a real treat for fans. McKagan and Fortus weren't forgotten, either. McKagan – sporting a purple Prince symbol on his bass – doubled briefly as lead singer, providing vocals for "You Can't Put Your Arms Around a Memory." Later, Fortus and Slash traded riffs for a duetted instrumental of Pink Floyd's "Wish You Were Here." But the same didn't apply for Reed, Reese and Ferrer, who were all but left in the background for the duration of the show. While Rose made it a point to introduce the band members several times, it didn't stop half of the group from feeling lost in the stage's shadows – a problem that has persisted since earlier dates. Nonetheless, Guns N' Roses genuinely had a good time. With Rose's exuberant persona balanced by Slash's unnerving coolness, their connection never felt stronger than the many moments they spent singing and playing off one another, both often lost in levels of cathartic release. Even when Slash took over guitar duties for numbers off 2008's 'Chinese Democracy,' recorded entirely without him, he didn't feel out of place. As evident by the giant smile that often crept its way onto Rose's face, he was happy to be there – and happy to have his original bandmates at his side. No songs hit harder than the classics from Appetite for Destruction, the group's 1987 debut record: "Sweet Child O' Mine," "Mr. Brownstone" and "Rocket Queen" were set highlights. And when the group finally closed their 24-song performance just after midnight with "Paradise City," complete with fireworks and a confetti shower, the two-and-a-half hours still didn't feel like enough for a full Guns N' Roses experience. The group began rehearsing at Detroit's Ford Field on Monday, following teardown of Beyonce's stage from her June 14th performance. Although a tremendous debut evening, it came with a few hiccups to work out: What appeared to be a succession of pyrotechnic fails sounded like rounds of gunshots, unnerving particularly following recent terror attacks in music venues. Backup vocals were also on the low side, almost entirely drowned out. But it didn't deter from the overall show, which was so deeply steeped in electric energy that a couple mechanical flaws couldn't chip at its magnitude: this night was history being made, and there was no taking away from it. That was a really nice find, @Uli.